"All you need are two same sized hand towels and you can already sew a handy basket for the bathroom. 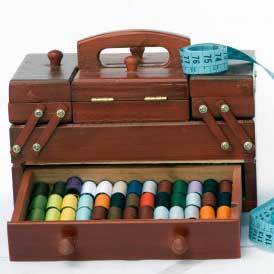 It can be used to hold all sorts of things from cosmetics, brushes or anything you want to keep organized together. The terry cloth has a lot of body so one of these will stand nicely without any extra batting. The material has another great advantage is that it is easily washed like a towel should it ever be necessary. The illustrated tutorial shows a Christmas basket and except for the applique, the instructions are the same for this project." 'Soft pots' are a definite favorite of mine! I would have them absolutely everywhere but the family keeps me in check, lol! This terry cloth hand towel basket is just about the cleverest bathroom idea I have seen and I have added this to my ever growing 'To Sew' list. Thanks for the great idea! The terry cloth used in this project is ingenious! Since it's so absorbent, I don't have to worry about ruining the basket if my bathroom toiletries get a little wet. Plus, it has that cozy look to it that will make transitioning from my bed to the bathroom every morning a little less difficult!